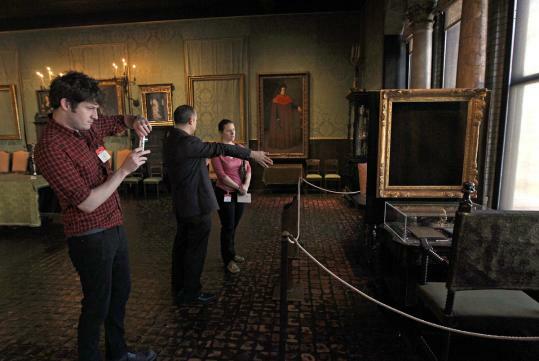 The capture last week of Boston’s most sought-after criminal has given rise to speculation about the potential return of the city’s most sought-after art objects: the 13 pieces of artwork stolen from Isabella Stewart Gardner Museum in 1990. The US Justice Department and close associates of mobster James “Whitey’’ Bulger have long denied any link between him and the art heist, the biggest in history. Still, former federal prosecutors and FBI agents said after Bulger’s arrest that the Gardner theft looms as a prime topic of conversation between investigators and the South Boston native — if he agrees to cooperate with authorities. Donald K. Stern, former US attorney, who from 1993 to 2001 presided over the investigation into the Gardner theft as well as the hunt for Bulger, said he remained skeptical that the octogenarian could provide significant leads on the theft or the whereabouts of the art. But because of Bulger’s notoriety for decades as the city’s leading criminal mastermind, it’s inevitable that investigators will want to grill him about a theft that has gone unsolved for more than 20 years. “Just because of who he is and what he knew about crimes and corruption in Boston over the years, the Gardner case has to be at the top of the list of other things that he gets asked about,’’ said Stern, now a private lawyer in Boston. Questions about a possible connection between Bulger and the theft arose almost immediately after two men, disguised as police officers, conned their way into the museum and made off with the artwork. Among the pieces stolen were three Rembrandts, including his only seascape, “Storm on the Sea of Galilee,’’ and a Vermeer, “The Concert.’’ In all, the purloined paintings are valued at $300 million to $500 million. Although the FBI has assigned far fewer agents to the recovery of the artwork than it did to the pursuit of Bulger, the agency has maintained a commitment to solving the case. Agents have chased leads from Boston to Tokyo, and last year, the agency announced it was resubmitting crime scene evidence for DNA testing in hopes of coming up with new leads. Nothing has been forthcoming. Matt Montgomery, the Gardner’s spokesman, said last week that while the museum would welcome leads, it has received no word that Bulger’s arrest might prompt a break in the case. “Until a recovery is made, our work continues,’’ the museum said in a statement. Brien T. O’Connor, a former assistant US attorney who supervised the Gardner and Bulger investigations during the 1990s, said that even if Bulger had no direct knowledge of the theft, he would have wanted to know who did it or where the artwork had been taken. “Bulger viewed Boston’s crime scene as his domain, and law enforcement is going to look to him for potential information on any major criminal activity, including the Gardner Museum theft,’’ said O’Connor, also a Boston defense lawyer now. If Bulger has information regarding the heist, it would come as a surprise to close associates such as Stephen “The Rifleman’’ Flemmi and Kevin Weeks. They have told investigators that during the five years after the theft when Bulger still terrorized Boston, he directly denied to them knowing anything about the crime. In addition, former FBI agent John Connolly, who handled Bulger as an FBI informant, has written in letters to a reporter that after leaving the agency’s Boston office in 1990, his former bosses asked him to approach Bulger about the Gardner crime. Connolly said that Bulger told him that he did not know who had engineered the theft or where the artwork had been taken. But the most definitive denial came last year from Brian T. Kelly, chief of the public corruption division in the US attorney’s office, who now spearheads the investigation into Bulger’s criminal activities. At a New York conference on the 20th anniversary of the Gardner theft held by the International Foundation for Art Research, Kelly said federal investigators had no information linking Bulger to the case. But the potential of a Bulger connection persists, in part because of the lack of hard leads pointing to potential suspects and in part because of speculation about Bulger’s past ties to the Irish Republican Army. IRA supporters had long shown interest in obtaining stolen art in hopes of trading the bounty for munitions or using it in negotiations with authorities for the release of arrested members. Also high on the list of key questions, Stern and others said, would be how Bulger was able to elude capture for 16 years and the identities of those who assisted him, as well as those in law enforcement and government whom he might have paid off between the late 1960s and his disappearance in 1995. Robert K. Wittman, a former member of the FBI’s art theft squad whose best-selling book “Priceless: How I Went Undercover to Rescue the World’s Stolen Treasures’’ included a chapter on his efforts to solve the Gardner theft, said that while he expected Bulger to offer to cooperate with investigators, he doubted information from the crime boss would prove relevant. Stephen Kurkjian can be reached at kurkjian@globe.com. Correction: Because of an archiving error, an earlier caption on this story misidentified the man in the photo. He is Matt Montgomery, spokesman for the Isabella Stewart Gardner Museum.